We are proud to represent a philosophy and protocol that can help so many people reach their health and fitness goals safely and efficiently. Our new machines are the purest expression of painstaking skill, distinctive design, and our unceasing commitment to upholding and facilitating the real primary objective of exercise. We have a tremendous passion for exercise machines and aim to create enduring, timeless instruments that set a peerless standard. For our iconic flagship, the Leg Press, we had to set that standard higher than ever. Leg press is the most important, productive, and meaningful exercise in our arsenal. It is the alpha and omega, the king in the hierarchy of all exercises. As Ken Hutchins has said time and again, if you could only use one machine and had to forego all others, it must be the Leg Press. When Ken designed his original Leg Press over a decade ago, it was to address the shortcomings of products that were available at the time. Ken’s compact design borrowed from what was worthwhile in existing products but he went several critical steps further to develop and an endless list of improvements, innovations, and features that permitted users to better experience the protocol and empowered instructors to better attend to their subjects. 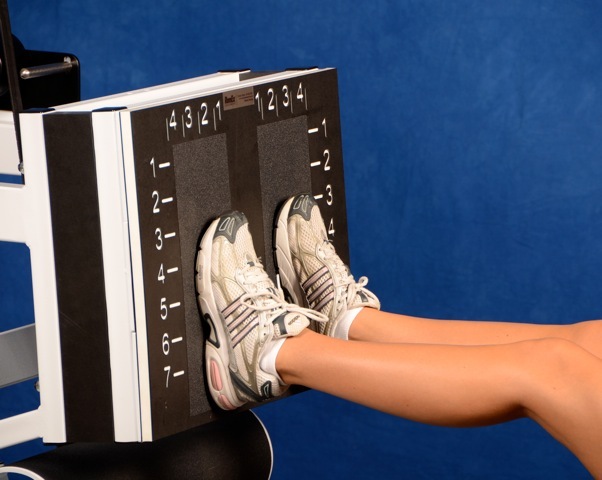 The key attributes that made up the original formula for the Leg Press are all still a part of the newly designed machine, including how little floor space it requires, but they have been elaborately refined and upgraded for a truly unsurpassable machine; the most important overall exercise for the human body. There’s no mistaking its iconic shape. The profile of the new Leg Press remains essentially the same as its predecessor but with more brawn. Everywhere you look you’ll see parts and fixtures flexing new muscle. 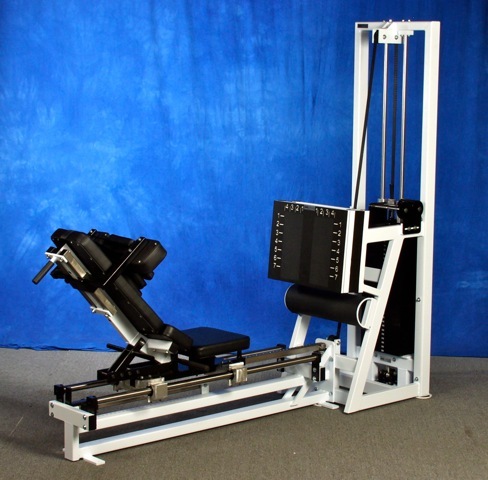 The streamlined body style, the taller weight stack header, the thicker guide rods, the integral, incremental add-on weights, the imaginative cylindrical calf-exercise attachment, the sleek bearing chambers of the new seat carriage, and the deluxe upholstery all contribute to the new leg press’s highly developed and polished appearance. Continue exploring its sharp angles and lean lines and you’ll discover even more design ingenuity including a range delimiter that now features micro-adjustable stops for true precision in tailoring the user’s end point. No aspect of this re-imagined machine went unnoticed. From the rigid fit and finish of all of the ancillary parts, to details like increased seat-tilt adjustability, to the high-quality powder coating of the frame, this new Leg Press stands in a class by itself. 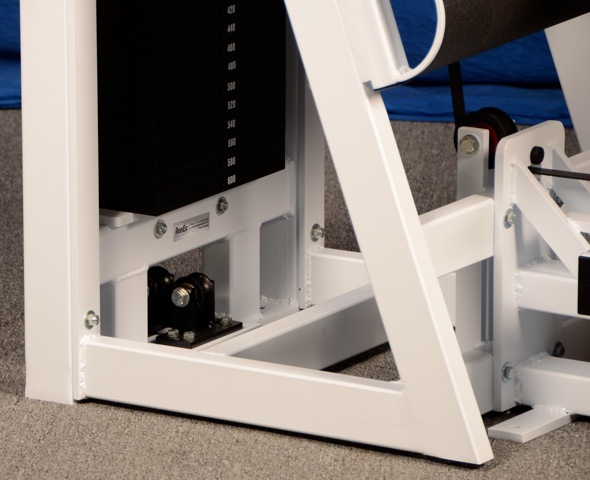 Of course, the defining hallmark of all the RenEx Equipment—the advanced engineering of the resistance delivery system—shines in the new Leg Press, as well. Leading the ample plates of the pin-indexed Freedom Stack™ is the UltraGlide™ top plate system, which delivers resistance in fluid, anti-friction style. Regardless of how much or how little resistance you select, rep after rep, set after set, the weight stack will behave with remarkably predictable, zero-contact precision for a truly inimitable strength-training experience. The most impressive new feature of the Leg Press remains camouflaged right in heart of the machine itself: The footboard. 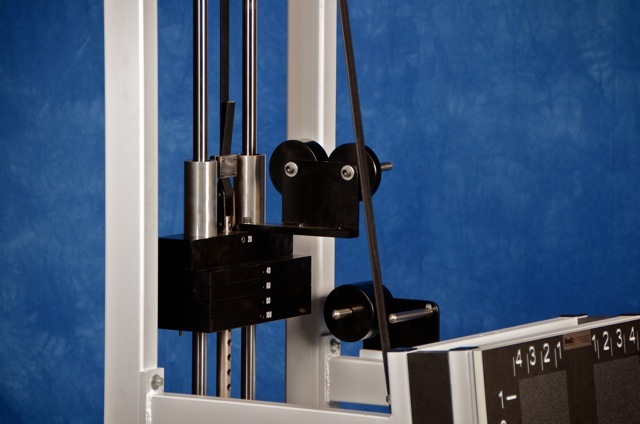 Those black spacers you see between the frame and the footboard are merely place-holders for a sophisticated force measurement system that delivers feedback to the working subject as well as the instructor, in real time, on an integrally mounted computer monitor. Load cells attach to the footboard and receive compression force input as you push the movement arm to raise the resistance. The cells are transducers that convert force into an electrical signal that is interpolated by a computer to display your actual force output. Now for the first time, you can reveal not only the precise loading forces at the start and turnarounds of each repetition but also the level of force during successive squeeze technique repetitions at the pre-determined end point. Since the inception of our protocol, instructors and subjects alike have been at the mercy of conjecture when it comes to evaluating effort in exercise. The best we’ve been able to do is to rely on best-guess estimates within the limits of our equipment and our experience as instructors. Now we finally have a tool to help detect malingering, segmenting, off-oning, and many other discrepancies and performance factors. As an added bonus, the entire feedback system can be used as an independent Timed Static Contraction (TSC) device. Force measurement and feedback means you have the ability to perform staged, isometric exercise with zero guesswork. Now TSC can be as progressive as any dynamic system of exercise or rehabilitation. 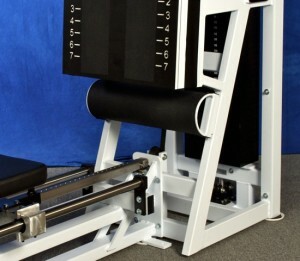 Since its debut, the Leg Press has revolutionized what it means to exercise using our protocol. Moving into the future we now offer more. More performance, more efficiency, more capability, more safety—the RenEx Leg Press impresses during every set, turnaround after turnaround, repetition after repetition, and embodies the Renaissance Exercise philosophy with uncompromising sophistication. Stay tuned for our next installment of our latest innovations. We have had some tremendous feedback on the new line of equipment and a lot of people are dying to try and buy it. As always, let us know your thoughts by posting in the comments section below. And to keep up with our progress make sure you are on our email list by filling out the form below. This looks GREAT!!! I am sure our clients would really HATE this!!! In all seriousness though…as brutal as this exercise is to the physiology clients come away will a real sense of satisfaction after completing the set. Nearly every new client comes in apprehensive, reserved, or even completely adverse to any real exercise stress. Nearly all of them open up in every way after they learn the protocol on the RenEx Leg Press. This machine is EVERY THING to this model. When I see the leg press one thought only comes to my mind: I want to use it NOW! My god, what a brilliant comstruction. As good as the other machines looks (and Im sure they are fantastic) this one blows my mind away. Eagerly looking for more stuff to happen from you guys, so far VERY impressed. now this I do like, its looks awesome! You definitely did save the best for last!!! I was expecting something brilliant but you guys have exceeded my expectations. Although Lexus claims to be about “the relentless pursuit of perfection”, you guys have not only pursued it, you have achieved it. I feel fortunate to be able to experience this advancement in exercise equipment. Congratulations!! We have prototypes in design and testing as we speak. Our Trunk Extension is almost ready for production, we believe it will redefine strengthening and rehabilitation for this movement pattern. Much more to come from RenEx! One of these days I am going to catch a flight to Cleveland. RenEx equipment is the gold standard. Guys, thanks for your enthusiastic responses so far. As pleasing as the new machines are to the eye, it is their function that will truly impress. Despite ongoing efforts on my part to try and describe how these things feel with words, only a test drive can truly deliver the experience. And as Josh has indicated with these blogs, this really is only the beginning. Moving forward with yet new machines and force measurement, we are ushering in a whole new understanding of the concept of “minimum effective dose” and we aim to help properly redefine many of the original concepts of the ‘abbreviated/high intensity’ exercise and rehabilitation communities. It’s an energizing and exciting time and we are devoted to reaching the highest summits for Renaissance Exercise. Dear Gus,I was wondering if you will be avaible for personal training soon at you facility in Toronto.I am working out of town now but will be returning to Toronto by summer.Thanks in advance! hmmm I wonder how much a flight to cleveland is these days? Not just the flight I was wondering how to get it under my coat with out Josh noticing! Love the calf part but better yet the sensors! The lumbar portion of the seat back is designed wrong. The pads should provide for an arched lower back, not concave resulting in anterior pelvic tilt which causes anterior spinal compression. It’s understandable why you believe that the pelvic pad is incorrect but in fact your concerns apply to the shoulder/trapezius loading of a squat, not the pelvic loading of a leg press. An extended back (‘arched’ is a nebulous term) is neither safer nor desirable in a proper leg press. In fact, almost all of the RenEx body positioning principles defy conventional wisdom and this is by exclusive intent. Backwards Machines | High Intensity Training by Drew Baye – Build Muscle. Lose Fat. Get Fit. | High Intensity Training by Drew Baye – Build Muscle. Lose Fat. Get Fit.